Terry's career as a stage and club comedian allowed him to hone his comic timing, and no-one could rival him when it came to his comedic speciality- 'The Drunk Act'. His routine as a drunk, returning home from a long night on the tiles was astonishing in its truthfulness and in the number of sight gags he could wring out of a battered suitcase of props. In fact, when I worked with Terry during a Music Hall at the Kenneth More Theatre, so convincing was his act that he almost didn't get the opportunity to perform it! He would enter from the auditorium, rolling and staggering, engaging in banter with the audience before eventually making his way up on to the stage. An over zealous usherette spotted this trouble maker as he stumbled into the auditorium, and, enlisting help, attempted to eject him from the theatre! Terry's film and television work included the Terence Stamp and Carol White film 'Poor Cow' in 1967, a year in which he also appeared in the prestigious 'Wednesday Play' on television, 'An Officer Of The Court' and in 'Profile Of A Gentleman'. In 1969 he made an appearance in 'Randall and Hopkirk' (Deceased)., and in the film 'A Nice Girl Like Me'. Fans of 'On The Buses' looked forward to spotting Terry appearing in various roles, often opposite his wife, the actress Anna Karen, playing 'Olive'. In 1970 he appeared in the Hammer Film 'The Horror Of Frankenstein', followed in 1971 with the film 'Family Life'. He also found time to appear in variety and clubs, as well as panto appearances. He appeared in BBC's 'Dixon Of Dock Green' in 1972 and again in 1974, and appeared with Anna again in the 1976 film 'A Place To Hide' followed by appearing with his wife in the 1977 film 'What's Up Nurse' and the horror film 'Schizo'. Terry arrived at Grace Brothers' store in 1977 to play a cameo in 'Are You Being Served' opposite John Inman and Trevor Bannister, and continued to appear in theatre throughout the eighties, along with appearances on television in 'Poirot' and 'A Class Act', as well as 'Murder By Decree'. 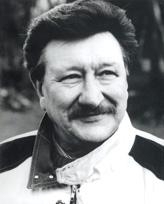 He wrote the Shaw Theatre's 'Aladdin' in 1986 which starred Anna, along with Norman Beaton, Debbie Bishop and Martin Chamberlain, and over the years has been instrumental in providing material, gags and very sound comic advice to pantomime artistes. Terry was married to Anna for 40 years; he was a member of the Grand Order Of Water Rats, and was a great support to Anna when she, as a member of the Grand Order of Lady Ratlings, was elected 'Queen Ratling' in 1990. I am proud to have had Terry as a friend, and deeply indebted to him for all the 'fine tuning' and practical advice he gave when it came to writing or performing in a routine or a 'scena'- He could be relied on for the perfect joke or bit of comic business that was missing from a routine, and would go to great lengths to ensure every last piece of comic potential could be extracted from a gag or even a word. King Rat and all Terry's Brother Water Rats thank Nigel for his notice and agree with him that Terry will be greatly missed by his many friends both in the profession and amongst his fans.